The main screen of A.I’s Virtual Studio draws the student into an interactive panorama. Click to launch the site! Flash Player required. Shortly after Craig Taylor and I spoke at Adobe MAX ’09 in L.A., Art Institute approached me about making a custom interaction for their photography program. 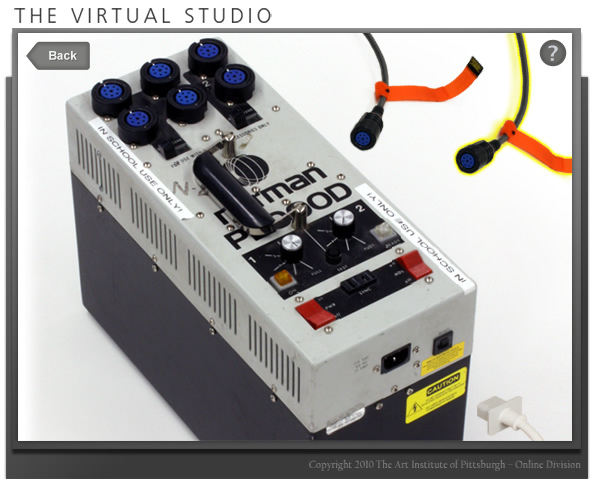 They were looking for an interactive way to help students learn diagnosis procedures for photography studio lighting with the level of realism we delivered for the Miami University’s Theatre Lighting Crisis. We designed a few custom components to be re-used by a sister (South) university’s nursing activity which is currently in the works. The logic and procedures will be very similar to the VS’s components. But, by inserting new imagery, a completely new look and feel can be achieved (stay tuned on that one). The folks over at Education Management’s Corporation’s Instructional Design (Mike Link) and Photography offices at A.I. did a top-notch job on providing us with the best high-res digital assets to work with. This activity is so smooth and flowing, and the imagery is so clear, you actually feel like you are in the studio yourself. This immersive environment works the way it was supposed to. Students of A.I. are taught the procedures of setting up the electrical components and diagnosing failure points in class before they actually do the online activity. Having that info already provided for them left us the ability to focus on the interaction and real-game play. You, the photographer, have 10 minutes to make sure the studio’s electrical components are functioning properly before the supermodel arrives for the shoot. You need to work in the correct order (as taught in class) to fix/connect things that are broken or loose. Make sure you check everything. Go!! 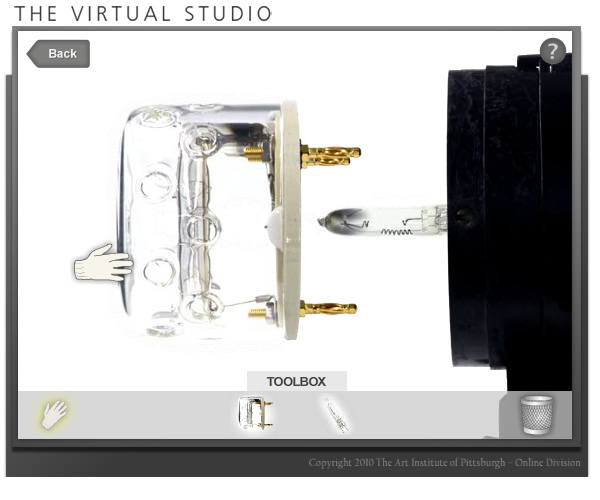 Try Art Institute’s Virtual Studio yourself. This custom component includes error checking and order-of-operations logic that can be re-used by other Art Institute interactions, simply by swapping the image assets. Looks like we’ll be doing more activities for A.I. and its sister university in the future! © 2012 The Art Institute of Pittsburgh, Online Division. Republished with permission from The Art Institute of Pittsburgh, Online Division. Unauthorized copying or use prohibited. This entry was posted in Game, Interactive, learning activity by Britt Carr. Bookmark the permalink.